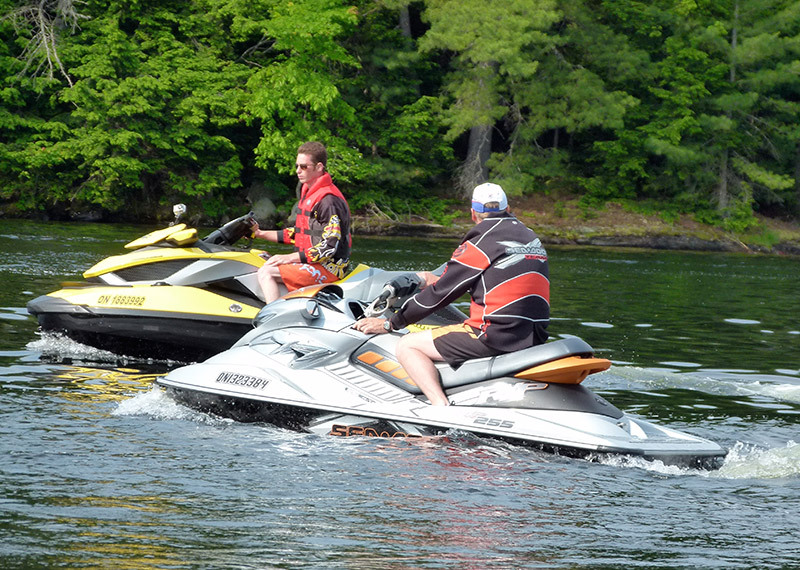 Some riders like riding in nothing more than bathing suit and a PFD. Not me. I rarely ride my Sea-Doo on tour without full body coverage. Exposing my pale flesh to the elements for six consecutive hours or more while zipping along on the water can be downright uncomfortable. I’ve had my skin look like a boiled lobster, even with sunscreen. I’ve had it desiccated by hot, dry winds and agonized by a thousand pinpricks from driving rain. I’ve even had bruises where some bat-sized insect splattered itself against some part of my anatomy. A good reason to keep my mouth shut while riding! So just like in the winter, I layer for Sea-Dooing. I go for quick drying under layers (no cotton) like a Sea-Doo technical boardshorts and Pro Rashguard combo. If needed, I add a pair of quick dry long pants and a Sea-Doo Freewave jacket. If the weather gets any worse, I really blew my decision to ride that day, but the Sea-Doo Men’s Team Neoprene Riding jacket can save the day. I got mine big enough to go right over everything else I’m already wearing, including my PFD. Another good choice for superior protection is one of Sea-Doo’s full body wetsuits. With no windshield or helmet visor to protect my face, I always wear sunglasses or goggles so I can see properly and avoid eye injury. Sea-Doo Vehicle Gloves keep the backs of my hands from frying. A pair of Sea-Doo Booties protects the sensitive skin on the tops of my feet and ankles and keeps feet warm in cold water. Most of the time, I even wear a Sea-Doo cap for scalp protection and to help cut the glare. Usually I find myself in one of two scenarios. Either I start in the cool of the morning wearing everything I own and take it off as the day warms up. Or if conditions permit, I may start lighter, but always carry another layer with me just in case. With a little planning there’s enough storage space on board to strip down en route or carry extra gear. Worst case, I can bungee something to the passenger seat strap or grab handles if necessary. That way, I’m always dressed to ride. Talk to you next time!